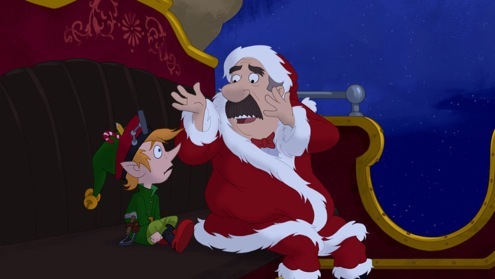 As hoped for holiday classics go, NBC’s How Murray Saved Christmas might as well be titled Inside Rudolph’s Sinus Cavity. Kids of all ages are unlikely to warm to this animated hour of forgettable songs, ill-drawn characters and rhymes without reason. The story’s uniformly lousy, too. Other than that . . .
It’s all adapted from a same-named children’s book by Mike Reiss (The Simpsons), who serves as executive producer. Entirely without any women in featured speaking roles, it’s principally voiced by Jason Alexander, Sean Hayes, Dennis Haysbert, Jerry Stiller, John Ratzenberger and Kevin Michael Richardson. Home base is a town called Stinky Cigars, which for some reason is populated by the likes of Abraham Lincoln, George Washington, the Easter Bunny, Columbus, Uncle Sam, Cupid, the New Year’s Baby, April Fool and a gopher who talks like Woody Allen. All of the above are basically window dressing during prolonged sing-alongs. The principal characters are grumpy diner owner Murray Weiner (Stiller), earnest Edison Elf (Hayes) and Santa Claus (Richardson). Alexander chips in as nutty Doc Holiday, Ratzenberger is officious Officer Bender and Haysbert narrates. Santa Claus basically runs a sweat shop whose hundreds of elves are paid nothing and sing about their basically deplorable situation. They get briefly excited when Santa walks in with a tray full of hot cocoa. But he’s charging exorbitant prices that none of the elves can afford. The old, bearded taskmaster sees stars, however, when he’s accidentally socked in the face by Edison’s latest invention, Jack in a Boxer. “Christmas must be canceled. That’s the end of the discussion,” Doc Holiday sings. But Edison, who very much looks like a Rice Krispies character, decides that Murray somehow is just the guy to fill in for Santa. After a suitable amount of carping and kvetching, Murray signs on. What promises to be a long night of bumbling and stumbling is waylaid by a six-year-old kid who at first calls Murray’s Santa a “big phony fake.” But he’s then won over by the sight of a sleigh and reindeer atop his home. This also inspires Murray to whisk his way through the entire world. “Don’t worry, it’s the finale,” Edison assures him. Thanks for that at least.